Two of Royal Caribbean's newest water slides opened today on Liberty of the Seas. The racing slides, known as The Perfect Storm, opened on Liberty of the Seas to guests today to enjoy. The Tidal Wave slide should be open tomorrow. Tidal Wave slide should open tomorrow. 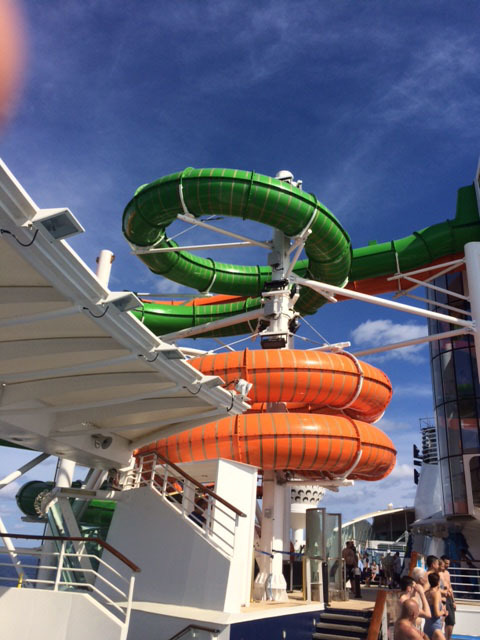 Guests have the choice between riding the green or orange slide. Royal Caribbean Blog reader Chris Bowers reported there was an LED light in the green slide and it was a "fast ride." He also noted that if you have a choice, he preferred gren because it had great visuals.